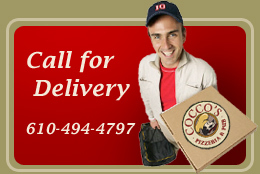 Cocco's Pizzeria & Pub would love to help you with your next corporate event. Cocco's Aston can cater your corporate events - large or small. From a small executive lunch to holiday parties or corporate picnics with 1000 attendees, we can help. We have a wide variety of food selections available. We also have billing options designed to make planning your event as easy as possible. We know that your reputation is on the line when you select a corporate catering partner. We want to make you a success. Please give us a call for personal catering planning assistance.